This weekend I crafted up a storm decorating my house with some glowing Christmas stockings. I saw these stockings as I was wandering through the Christmas aisles of Hobby Lobby a few weeks ago and immediately had some tech in mind to add to the designs. Here's a showcase of a few different ways to add some electronic sparkle and shine to your stockings with without any soldering! Read on for some progress shots and links to the full tutorials on Instructables. The first stocking I created was super easy, using a string of fairy lights to trace a reindeer silhouette. Using invisible/clear thread to attach the string lights made it look like the stocking was purchased that way! The battery pack is hidden on the back of the stocking and kept in place with a little velcro. Stitching the string of lights around the edge of the design. The second stocking I built uses chasing EL wire, which is a fun EL wire that turns on and off strands within the casing to create an animated effect. I placed the EL wire along the lovely waves/curves of the embroidery. It was a little trickier than the fairy lights design, as I wanted to hide pieces of the wire so the one strand looked like multiple strands. Cutting holes in the stocking to thread the EL in and out of the lining worked great. I'm really happy with how this one turned out. Pinning all the EL wire before stitching onto the fabric. Threading the EL wire through the lining to hide sections of it. EL wire stocking complete! This one uses 'chasing' EL which has multiple strands in it which creates an animated effect. You can adjust the speed with a dial or set to a solid glow. The last of the three involved a little more construction and time, but it is my favorite. 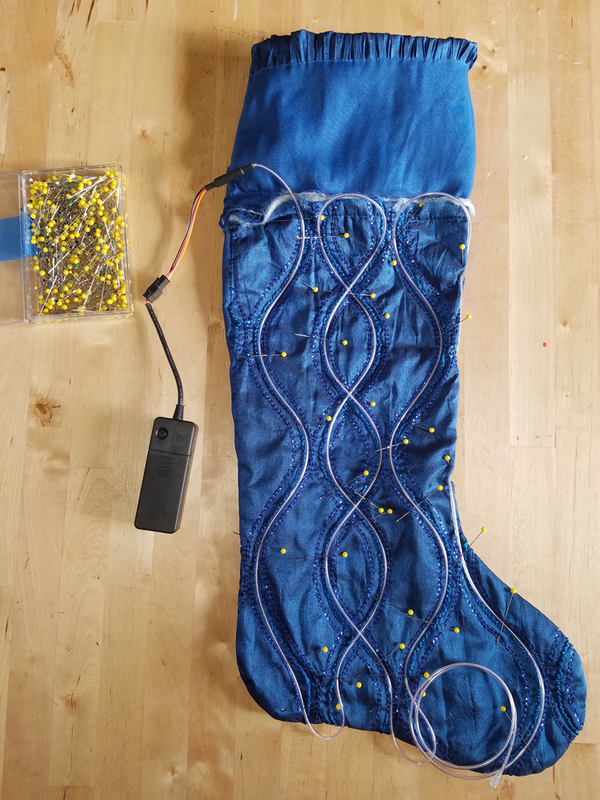 This stocking has sewable electronics embedded directly onto the lining of the stocking using LilyPad pieces and conductive thread. I used a LilyPad LilyTiny, which comes with pre-set modes that will display on the LEDs hooked up to it. The beaded sequin design of this stocking was perfect for some white LEDs to shine and twinkle through. Fritzing diagram for the hardware hookup. Prototyping with LilyPad pieces before sewing into the projects. Alligator clips are a great way to quickly test your connections before committing to stitching. Sparkling stocking with LilyPad LilyTiny and LEDs. This summer I fell in love with hoop dancing and have been brainstorming fun ways to combine hooping and soft circuits. Most of us have seen the fancy LED and fire hoops that make for great performances, but can it be taken a step further and have truly interactive hoops? Here are a few projects I’ve found that bring hooping to a whole new level. At the end of the post I’ve included documentation of some of my own early prototypes. I’ve seen a lot of LED hoops, but fiber optic lighting is a fun twist. This one isn’t interactive, but still captivating to watch. This project concept from the Interaction Lab at Holon Institute of Technology utilizes an elastic preassure sensor on the body to register the rotation/pressure of an ordinary hula hoop and translates it into a musical game. The Hip Disc uses conductive fabric on the edge of two hoop-like discs to trigger music. 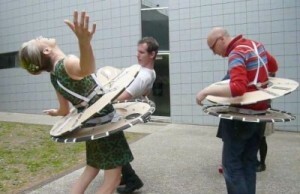 Not quite hooping, but it is an interesting new way of controlling music with your body. Musical Hula Hoop – Fact or Fiction? Hooping.org has a great article on the future of sound making/controlling hula hoops. I really like this use of a hula hoop as part of an interactive game/live show created using Processing and webcams. I’m particularly interested in POV toys and if they can be successfully installed on a hoop in a seamless way. I’ve been talking with Instructables author Quasiben (who made a nice and simple Arduino POV) about creating a hoop that you can send text to through a smartphone and change the graphics on the fly. The video below is my first test to see if the hoop rotation was fast enough to display the text properly. Next step is to get the hardware into/on the hoop in a more permanent, clean way (right now it is just taped on the surface). My other experiments have been playing with the idea of the hoop itself being a trigger, with most of the electronic components residing mostly on a garment. This solves the problem of bulky tech in such a small space. I’ve glued some conductive fabric tape on the inside of one of my hoops and have then been using patches of conductive fabric on various shirts as contact points. When hooping across these areas, the hoop acts as a switch. Many hoop dancers use music with their performances, so what if you were able to create the music based on your movement? I’m experimenting with a beatbox drum machine toy to see if I can get some interesting flow happening. I’ll be bringing my prototypes to the Hoopium hoop jams to talk with more advanced hoopers about placement of electronics and feedback. Stay tuned! Here are a few tests of crochet stretch sensors (and some more knit sensors for comparison) as I try to determine the method that works best for me. I did a few experiments with crocheted vs knit sensors, conductive yarn vs conductive thread, and felted vs non-felted, and using elastic thread to see how each variation of the sensor would compare to the others. I made a felted crochet stretch sensor following Felted Signal Processing’s Instructable – their method uses elastic thread to help add stretch and regular conductive thread along with wool yarn. It was a little tricky keeping track of 3 strands while crocheting, and you can see from some of my pictures that I dropped a few stitches in places. I could only find the elastic thread in 11 yard spools, and these sensors (between 11″ and 15″) took about two spools each to complete. This type of sensor took more time and materials than the spool knit samples I made, but had a nice solid feel to it. Here’s a side by side comparison of a felted sensor and the others ready for felting. And all the finished sensors. The crochet sensors, while nice and sturdy, weren’t really all that stretchy. I also noticed that they didn’t bounce back, and over time would stretch longer and longer. Maybe a different type of elastic would help with this issue. The conductive thread sensors also need to be very long in order to get a large range of values, so I think the knit sensors with conductive yarn will be the way to go for hooking up to a drawdio. This week my order of Nm 10/3 Conductive Yarn from Plug and Wear arrived. I immediately started making some samples of the knit sensors I blogged about a few weeks ago. Following Hannah Perner-Wilson’s tutorial/method, I made two sensors using a Wonder Knitter from the craft store. 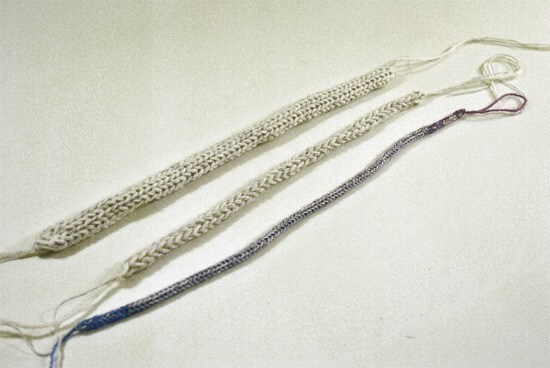 It came with two attachments, a 3 pin and a 6 pin to make a thinner and thicker knit tube. After making two knitted sensors with a combo of acrylic yarn and conductive yarn, I made my own knitting spool out of an old thread spool and some nails. I used some sock weight yarn in a similar thickness to the conductive yarn and made a nice thin sensor. Here are the three sensors I made side by side. They are about 15 inches long with tails to connect the conductive yarn to alligator clips for testing. After doing some more tests, I’m going to start prototyping a knit version of my Musical Drawdio Puppet using the sensors as the tentacles so that you can ‘play’ it by pulling on them. I’ve also been teaching myself to crochet and will be trying out more techniques soon. I made a crochet button using the example on How To Get What You Want. Awhile back I purchased a couple of Gakken Mini Theremins to play with. They are the perfect size to embed into stuffed toys (the magazine that came with the kit even has an example with a plush dog toy). Around the time that I was getting ready to head to the World Maker Faire, I had the idea to use one of these mini theremins and put it into an anglerfish puppet – the bendy antenna would be the perfect size for the fish’s lure. I originally started making a fish out of fleece but found it was hard to hold it’s shape. I put the project on hold while I got everything ready for the faire and it got ignored for awhile. In the past few weeks I have been teaching myself to crochet and making some amigurumi critters. I was looking online for some new patterns to try and remembered my anglerfish project – why not try and crochet one? Since I couldn’t find a pattern to follow I decided to make up my own version. While a little cartoony, I’m happy with the result. Once I had a basic fish, I prepped the mini theremin to go inside. I ditched the red case the circuit board came in and replaced the AA batteries with AAA in a holder with an on/off switch. I also replaced the antenna with a sturdier one from an RC car. The final touch was adding an LED for the anglerfish’s lure and as a power indicator. Once everything was hooked up I put the board in a small plastic box to protect it, and threaded the LED and antenna into the plush’s antenna. I found that if the wires from the LED were too close to the antenna wire it would cause interference, so I ended up attaching them along the outside and covering them with a whip stitch. Everything went into a pouch inside the fish to keep it from getting tangled in the polyfil I used to stuff it. Velcro along the edge makes for easy access to the battery pack to turn it on/off. Packed up and ready to play! So far, the antenna isn’t very sensitive so you have to be right up close to the fish to get any change in the sound. I had the same problem when the theremin was set up as a kit before hacking it, and am looking for a way to get a better range. There are some potentiometers on the board for adjusting and I saw something about using tin foil to ground it through the battery pack, so I’ll try a bit more and see if I can some better sounds out of it. If I get some good results, my next step is to add an audio jack to hook it up to an amp, and maybe turn the eyes into knobs for on-the-fly adjustments. Today I made a sock puppet that makes sound when you open its mouth. I used one of those greeting cards that plays sounds when you open it, some felt, and plastic buttons. It was a quick project for a rainy day and is a great way to use up old cards. I’d like to make another version with a card that you can record your own sound into. It would be fun to place the record button in the puppet’s ear and maybe have some light up eyes too. Visit Make: Projects for the full tutorial. The LED at the bottom is red and only lights up when there is no signal. The row of LEDs above indicates signal strength. If you hold the button down an LED at the top acts as a flashlight. After opening up the casing, I found that the board was nice and compact. At first I thought I would be able to desolder the LEDs and arrange them in a new configuration on a bracelet, but they ended up being too small for my current soldering set up and skill set. For now, I am just focusing incorporating the board and it’s current function into a wearable bracelet. I soldered some wires to the battery terminals and switch so that I can create soft battery holders and a soft switch. Then I cut out a piece of neoprene with holes to embed the board and batteries in. This gives the bracelet a bit of cushion for the components and keeps everything at a consistent thickness. I placed some conductive fabric and thread to act as battery terminals, and sewed a simple pouch to hold them in place. Finally, some metal snaps connected to the batteries will act as a power switch so that it is only on when the bracelet is being worn. Unfortunately, during my prototyping/experimenting process, I left the batteries in and one of the loose wires shorted out the board. However, I ordered a second keychain just in case I had any accidents, so I will be trying again soon. The dead board gives me an opportunity to try and get those tiny LEDs off and brainstorm a better design for the final version. See You at Boston Mini Maker Faire! This weekend has been all about preparing for the Boston Mini Maker Faire. I have been gathering up all the projects I want to bring, getting some fresh batteries, and making some fun stuff for my booth. Here is the felt banner I made to put over my table. While packing up my projects and doing a bit of spring cleaning, I came up with the idea of a portable scrapbook/notebook as a better way to house all my favorite techniques, prototypes, components and samples. I really enjoy the computational sketchbooks and electronic pop up books that Leah Buechley’s High-Low Tech research group have created as a way to demonstrate paper computing techniques. Why not make my own using the soft circuit materials I have on hand? It is a great alternative to digging through tool boxes, bins, and drawers when I need something specific. The thread page has bobbins that I attached with snaps, I can remove them to show others or to grab a small sample to take if I want to sew outdoors or at a craft group. The Bekaert threads came in ziplock bags and giant cones, so I am really happy with this alternative storage. The battery holder page has two of my favorite methods for making soft coin cell holders. I attached one finished/functional holder with elastic loops (on the left), and then an exploded view to show how the pieces work and are constructed. Seeing them side by side is good for a quick reference of techniques. The zipper page (in progress) is the first of the more interactive pages. This is an example of a digital zipper sensor technique created by Joo Youn Paek that I made into a module by sewing on neoprene and metal snaps. The module can attach to the page for a quick demo and then removed for prototyping a project. This particular zipper was a little hard to work with, so I’m going to try and find one with bigger teeth so that the conductive thread doesn’t interfere as much with the motion. This weekend was the annual RPM Challenge Listening Party. I was inspired the afternoon before to make a project to wear there. Though it was a little too ambitious of me to expect to get something functioning for the event with only a few hours of prototyping/design time, I did have fun and got a good start on a little soft circuit necklace hack. I brought the work-in-progress along to share with friends at one of the listening parties and worked on some the sewing bits while enjoying the musical selections of evening. Rather than try to build my own circuit from scratch, I went to a toy store and found this little ‘light show’ speaker on sale that pulses to the beat of your music. It was great place to start and after tearing it apart the board was small enough for me to incorporate into a wearable object. I used some wool felt and pieces of the original plastic casing to build a necklace form that I sewed the LEDs into. My first test was to translate the original circuit and function into something soft and interesting for me to wear. I cut out the speakers because I want to use ambient sound (originally the loud tunes at the party) and will be working on a way to hook up a microphone as an input. Here’s a video of it after I placed everything and tested it out with the original mp3 input. There are a few other adjustments I’m going to make, now that I’m not on such a short deadline, such as switching out the LEDs (they are a little too bright and multicolored for my tastes), adding a soft battery pack w/ coin cells, and an on/off button. Right now the board is hot glued into the piece and is a little bulky because of the capacitors. Stay tuned as I continue prototyping and the project evolves.